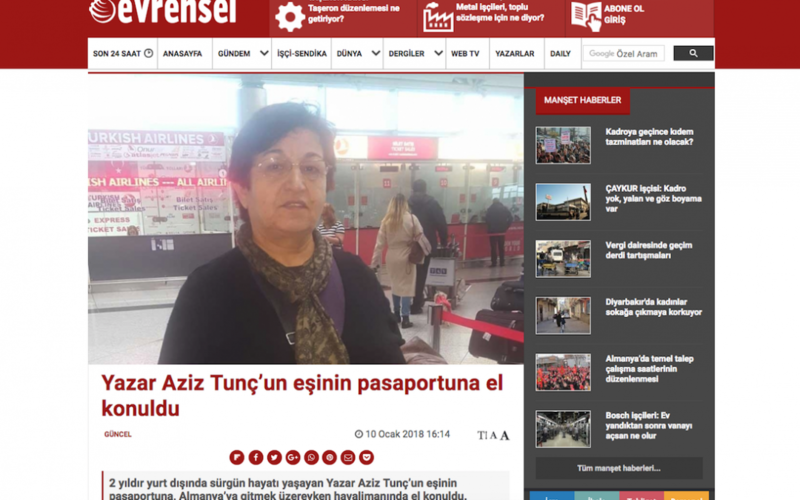 Police at Istanbul’s Ataturk airport seized the passport of Fatma Tunç, the wife of writer Aziz Tunç while she was on way to visit her husband in Germany, media said Wednesday. Briefly detained at the airport, Tunç was told by police that there are “suspected people” in her family and that she may go abroad only if her husband and son return to Turkey. Tunc’s passport was seized and revoked, media said. Author of several books on Turkey’s Alevi community, writer Aziz Tunc has been living in exile in Germany for some 2 years. According to media, he went to Germany for a panel discussion shortly before the July 15, 2016 and has never gone back to Turkey. The son Tunc also lives in exile fearing government persecution due to his political activities. “This is obviously an act of taking hostage. Associating my wife with me and my son means taking her hostage. It is illegal, unethical and inhumane,” the writer told Evrensel newspaper. “This is not happening only to me. They have done this to many people in Turkey. More unique sufferings took place. Neither my wife nor anybody deserved this. But, as it may be observed, there is a lawless and uncontrolled tyranny here. We have to live in exile just because we speak out these. And we are punished with such methods. The only way to get away with these is to expand the resistance,” he concluded.